Depending on either the year you were born, you may or may not have had the chance to get hands-on with the original Nintendo Entertainment System. The 8-bit graphics featured on this console were memorable and hold a special place in many gamers hearts. One of the most iconic games to grace the original Nintendo was the Castlevania series. These games usually featured a protagonist of the Belmont family on a hunt to stop Count Dracula. The games had various levels and worked as a side-scrolling action game. After almost 32 years later you’d think that we were way past the era that we’d ever see that type of game again. Right? 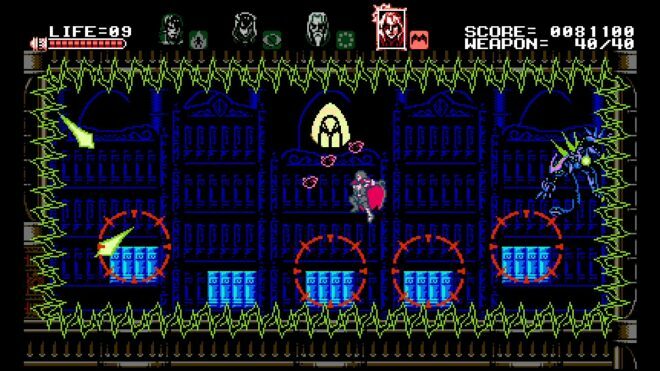 Interestingly enough, gamers have been blessed with a new, different title with the same great 8-bit side-scrolling action as the original Castlevania titled: Bloodstained: Curse of the Moon. Does the game deserve a place on your Xbox One hard drive compared to the more graphically enhanced titles of today or should we consider leaving the idea back in the past? Bloodstained: Curse of the moon opens to our main protagonist Zangetsu whose hatred for demons comes from the curse that they imbued him. He forms a relentless pursuit to eliminate every last one of them. One night, in particular, he sensed the presence of a greater more powerful demon. It was on this day that he swore that either the demons or the moon would feel his blade. Armed with the Zangetsuto blade and three various sub-weapons, Zangetsu swears victory over his foe. Mariam, Alfred and Gebel are our three adventurers that seek to aid Zangetsu. Mariam carries a whip and three sub-weapons containing knives, a rapier or an ax. Alfred carries a rod and has the choice of four different spells for sub-weapons. Finally, Gebel can summon darkness to hurt enemies and though he doesn’t have a sub-weapon, he can interestingly turn into a bat and fly around a stage. Gebel’s special ability and all the characters use of sub-weapons consume weapon points, which can be conveniently replenished by collecting various sizes of blue pots. Veteran or Casual – Possibly the smartest addition to a game of this style is the addition of difficulty settings. In many other 8-bit games, a player was given a set number of lives to complete the game. Had the player lost all their lives before beating the game, they were either given a game over screen and required to start the entire game from the beginning, or they were given a code that when entered into a password screen would take them back to the level they were last on. Such a system was fitting back when this style of gaming was first coming to light. In Bloodstained: Curse of the Moon, as soon as you select your first save slot to start the game, you’ll immediately be asked which difficulty you would like to play on. Veteran difficulty starts you with three lives, and death after those three lives is game over. This difficulty also features the inevitable knockback whenever you take damage. Casual difficulty has infinite lives available, and complete death in a level means starting from the start of a specific area of a level you were in. It helps the game to feel genuine to gamers that are familiar with this formula, as well as to newcomers who wish to experience the game without having to worry about the challenge. Multiple Characters – Zangetsu isn’t the only character you will have control of during the game. As you progress through the game, you will come across three different adventurers. These adventurers not only have different weapons and abilities available, recruiting them or ignoring their existence is key to unlocking the various endings the game has to offer. Of the three characters available, each has a special ability that can be used in various areas of the following levels for shortcuts or convenience. Each character also has their own health bar, which means if you’re reaching the end of Zangetsu’s health, you can switch to one of the three other characters available to help you progress even further or potentially complete a level. 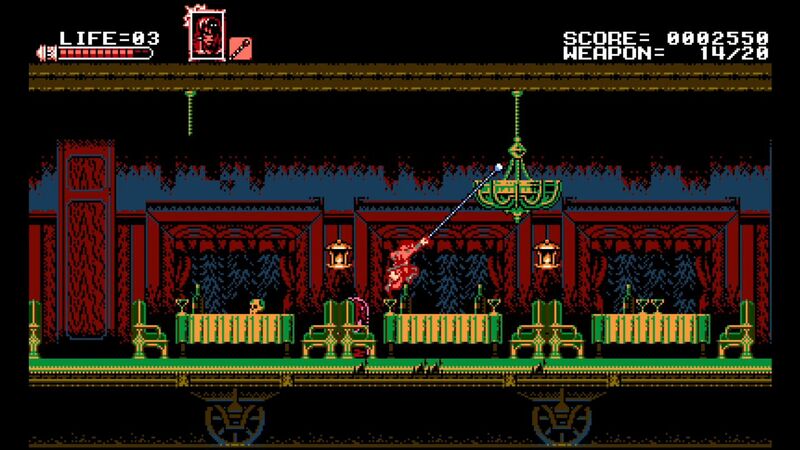 Inspired by Castlevania – The 8-bit side-scrolling concept of the original Castlevania isn’t the only thing that Bloodstained: Curse of the Moon was modeled after. Fans of the other series will quickly start to notice similarities in the game, as compared to previous Castlevania games both from the enemies you face and the different levels you explore. Each of the four characters even resembles one of the large protagonists of a previous Castlevania title. It’s definitely easy to tell that this game was heavily inspired by Castlevania in every way, shape and form. Old Style Movement – If you were to write a list of the various pros and cons that come with the original Nintendo games, you’d find a lot more listed on the negative side than on the positive. The game is modeled to look like an old 8-bit Nintendo game which is great, but by also adding in the old-style movement of the classic games makes the game feel clunky and frustrating on a present-day console. Players will quickly find stairs to be their worst enemy when they first start playing. One of the main issues regarding stairs involves your character climbing up and down stairs automatically when you were simply trying to walk past and go further down a corridor. Sometimes the game just assumes you want to go to the next floor of an area and snaps your character onto the staircase. Many other times when you’re going down a staircase, the game refuses to let you walk off. The biggest issue is when you try to jump off a stairway only to fall to your demise. As you reach the bottom, you press the stick in a certain direction with the impression that you will start walking on the ground only for your character to turn around and start walking back up the stairs. Character movement also feels strange. If you jump straight up in the air, you have to wait for the character to land before you can walk forward. If you go to do a forward jump and notice an enemy in your way, you cannot simply back up in midair to evade damage. Many elements players on modern games expect won’t be here. Prepare to die! – Relative to the previous point, chances are you will die, a lot! It’s not that the game is unrelenting. It’s that some enemies move in strange ways and manipulating your character to combat them can be near impossible. Zangetsu has the largest health bar of any of the other characters, but it’s not a saving grace once you realize just how much you’ll be getting hit by monsters. Some areas even have a never-ending spawn of monsters that can make not only progression but your character’s literal life, a living hell. The biggest issue involving death comes from the bosses themselves. 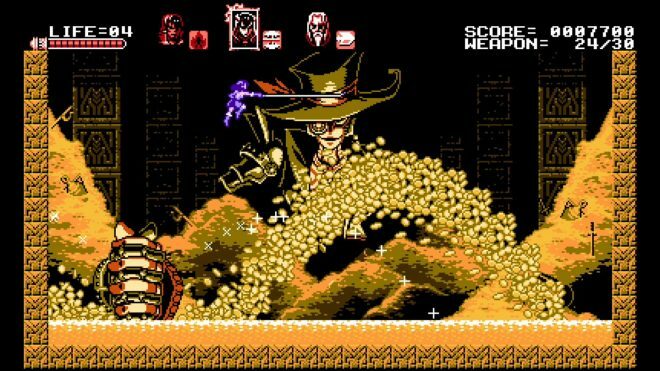 The moment you defeat a boss, they will immediately do one last epic attack which in most cases fills the entire screen and is almost impossible to avoid. If you are low enough on health, this last hurrah of an attack will kill you, and you’ll be forced to start the battle over. Quite frankly Bloodstained: Curse of the Moon isn’t the type of game that would be recommendable to most. The game isn’t bad by any means. The real reason is that it’s the type of game where you must ask yourself if this is something you would be interested in playing. Bloodstained: Curse of the Moon also isn’t very long by any means, but the different modes, various difficulties, and alternate endings make up for it. The asking price isn’t too overwhelming for what’s there, and the game is definitely a lot of fun when you cast aside the few issues it does have. Bloodstained: Curse of the Moon is an overall experience in itself, and a great game to hold you over until the release of Bloodstained: Ritual of the Night at a later date. 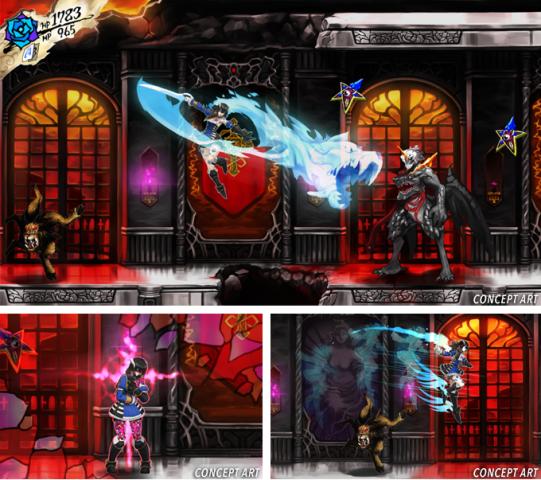 Bloodstained: Curse of the Moon was developed and published by INTI CREATES. 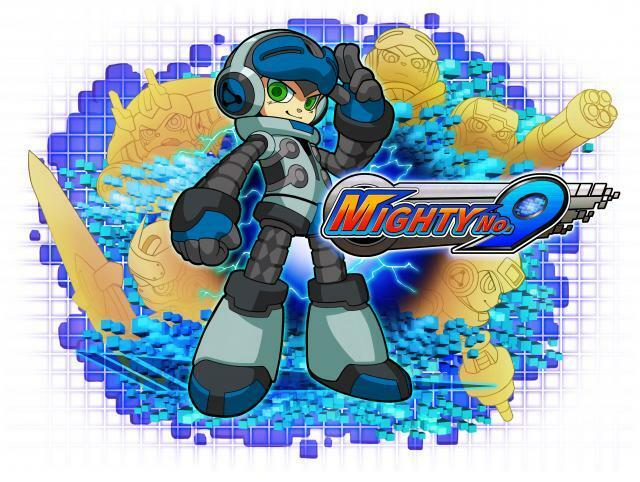 The game released on June 6, 2018, for $9.99. A copy was provided for review purposes.